Majority of users have multiple Gmail accounts like one for personal use another for professional use. Similarly, one could be using multiple accounts of other Google services like Google Reader, Docs, Calendar. Now you can login and use multiple Google (Gmail) accounts simultaneously at the same time using multiple sign-in to Google accounts feature. Following is easy procedure to enable this feature in your Google account settings. 2. Then login into your Google (or Gmail) account. 3. 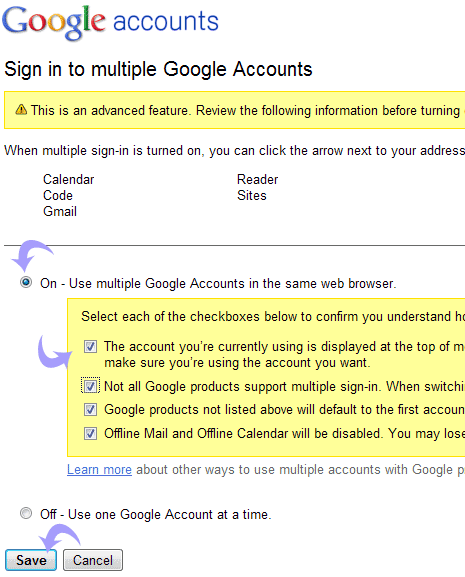 Select ON option for “Use multiple Google Accounts in the same web browser”. 4. Click to check options to confirm on understanding on usage of multiple sign-ins. 5. Then click Save button to enable multiple login for your Google account(s). To disable this feature, repeat above steps 1, 2 and then select OFF option. This will disable multiple sign-in for your Google account(s). As of now, multiple login feature is supported by Google services including: App Engine, Code, Calendar, Gmail, Reader, Sites and Voice. Google Docs will soon support multiple sign-in feature. Besides the above official feature of multiple sign-in, there are number of other ways to login into multiple Gmail and Google account. Checkout 5 more ways to Login multiple Gmail & Google accounts including: using different browser, session feature in IE, cookie swap plugin, user script and more.